Today is Easter Monday—a holiday here. Good Friday was a holiday here, too, which means my husband had four full days away from work for Ostern. When I lived in Asia, I was surrounded by people who didn't really know the Christian significance of Easter. 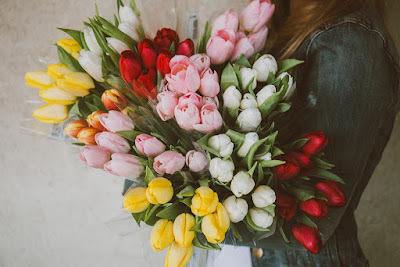 Last year it felt refreshing to come to Europe and, at the end of a dreary winter, see the shops fill with bright spring tulips and Easter symbols which are familiar to me. Although I knew that most here were celebrating a hollow version of Easter, with not a lot more understanding than my friends in Asia, it felt nice to once again be in a place where our Christian history is known and celebrated in some way. This was my second Easter in Europe, and probably not my last, since my husband recently accepted a job offer in a city just a few hours from where we now live. On Sunday afternoon we sat in McCafé drinking cheap hot drinks, being pestered by a beggar and eavesdropping on Hindi conversations. I told my husband that the weekend didn't really feel Easter-like to me. We had spent the last two days looking at apartments, checking out various neighbourhoods, wandering into shops and visiting a new-to-us church in the city where we plan to move. Half the time we were carrying our luggage for lack of a place to leave it. Maybe Easter didn't feel "normal" because we weren't with anyone we knew, or maybe it was because we were far from our families and their traditions, again. In any case, nothing about this Easter felt quite familiar except the rabbits and flowers in the shops, and the 90 minutes we spent in a church service. Easter is a day for the spring happies. It's the day to post a photo of your family in matching pastels on social media. It's a day to wear a wide smile and talk about the resurrection. But I'm not feeling bright and fluffy this Easter. There are weights that burden me. I don't know that my burdens are any greater than anyone else's, but as my mom always said, I can be overly sensitive. There are stones that I'm asking God to roll away for myself and others, and I feel weary of praying for the same thing over and over. I'm also mentally and emotionally adjusting to another move. But I suppose if I'm feeling more like a hollow cold tomb than bouncy furry bunny, my feelings are in line with the true Resurrection morning story. Last night as a brightly-painted bus carried us home (wherever that is) again, I read the final chapters of John in the darkness on my Kindle. I came across another woman with a burden. She was crying at the empty tomb, wondering where the body of her Lord had gone. Others had come and gone, "but Mary stood outside by the tomb weeping." I could relate to her lingering sorrow on Easter morning. Others had gone on their way (presumably for Easter brunch), but she remained. It blessed me to remember that Jesus chose to comfort the brokenhearted Mary first. The others who had left the tomb missed out on being there when He first appeared; it was to the woman who shared His sorrow so deeply that joy came first. The weeping, lingering woman was the one to whom Jesus entrusted the good news of His resurrection. If I find my heart weary this Easter, I am in good company. "Blessed are those who mourn, for they will be comforted." Jesus meets me in my sadness just like He met Mary in hers; our Savior is near to the brokenhearted. If you find your heart weeping this Easter, you can be sure that it won't always be this way. "In the world you will have tribulation; but be of good cheer, I have overcome the world." Brunch invitations and tulips are not guaranteed to us. The heavy stones of sorrows and trials are. But thanks to Easter—that is, thanks to Jesus—so is joy.